For Fox Sake: Funny mug with a cleverly disguised expletive. 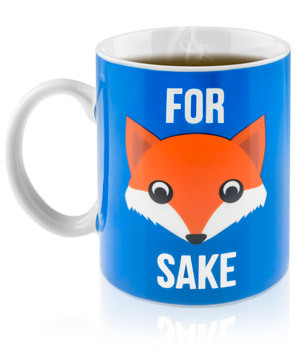 When you’ve reached the end of your rope, vent your frustration with a laugh and take another drink from the For Fox Sake mug. This clever-as-a-fox cup combines an R-rated expression with a G-rated drawing to let the world know how you’re really feeling. The ceramic mug will get a laugh out of coworkers, house guests, and anyone sick of dealing with other people’s bullspit. 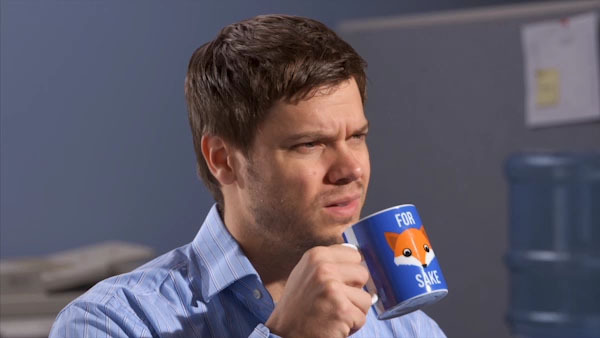 If you like your coffee with sugar, cream, and a lump of levity, start your morning with the For Fox Sake Mug. The humorous drinkware is fun for your own amusement and for the effect it has on others. Watch coworkers eye it with puzzlement, say it to themselves, and smile in recognition. It’s a sly joke that’s masked enough to be workplace appropriate and obvious enough to still get a laugh. 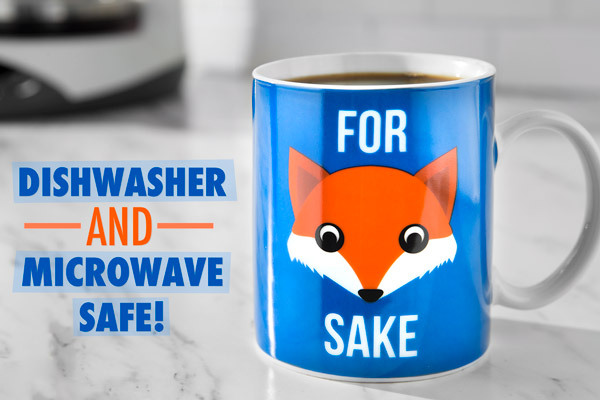 The For Fox Sake Mug is safe to use in the microwave or dishwasher without ruining the two-sided design. The blue face, white lettering, and orange fox head give the mug an attractive, multi-colored look. It’s the best way to be a touch crude without coming off like an animal. Laughter is a good way to let off steam. Answer: We’re gonna stop you right there. The joke is better (and less offensive) if said silently. Question: What’s the best way to clean it? Answer: The For Fox Sake Mug is dishwasher safe. Your mother may additionally wash your mouth out with soap.